Like I mentioned previously, I've worn this parka a ton, from day trips to multi-day backpacking trips where it's rained every day. When I first purchased it, I had not doubt of it's waterproofness. 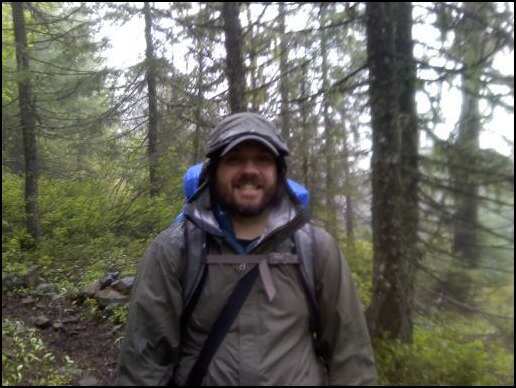 I was rained on 4 days straight in Olympic National Park, and stayed reasonably dry. The problem is that when you do get moisture under the parka, it's hard to tell whether it's rain seeping through, or just sweat. I am not quite sold on the breathability of this, or any water proof item. The fact is that if you hiking in hard rain for hours at a time, your core will warm, you will sweat, and your layers underneath will get damp. Obviously it is breathable, but in a limited fashion. Almost like a pair of boots. You can spend big money on waterproof, supposedly breathable boots, but it won't stop your feet from sweating, and your socks from getting damp. It's the same with this parka. Of course the armpit zippers really help in that department. When I don this parka usually the first thing I do is unzip the armpits. That way I can have some airflow to help it breath and keep me cool. The waterproofness is questionable too. Not that I've ever been soaked wearing this jacket, but I have noticed a decrees in performance over the years. Whether that is from washing, heavy use, or both, I'm not sure. Now, after nearly 5 years of use, I will it coat with a waterproofing spray before I use it in adverse weather, where I am expecting lost of rain. But most of the time it has kept me relatively dry, and usually I am wearing a quick-drying layer underneath, so when the parka comes off my shirt will dry pretty fast.